When it comes to treating your smile at Riverheart Family Dentistry, we accept nothing less than exceptional. 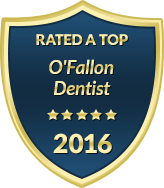 Our practice is focused on providing patients in O'Fallon and the surrounding communities with the highest level of dental care in a warm, comfortable environment. Dr. Travis Schwarz leads our practice as a gentle, skilled and talented dentist who can address all facets of your smile, from routine cleanings and periodontal therapy to dental implants and porcelain veneers. Whether you need a dentist who can provide top quality preventative dental care to your children or you want to enhance or restore the beauty of your smile as an adult, Riverheart Family Dentistry welcomes the opportunity to serve you. We know your time is precious and your comfort is important. We also realize the profound impact that a healthy and confident smile can have on your quality of life and overall health. At Riverheart Family Dentistry, we make every effort to create a rewarding and painless dental experience while respecting your scheduling needs. Our advanced dental technology allows us to perform general, restorative and cosmetic dentistry procedures with better efficiency, improved patient comfort and superior results. To learn more about our unique dental experience at Riverheart Family Dentistry, please contact us today. We take a personal interest in your smile and your family. You will find that Dr. Schwarz carefully explains your treatment options so that you can make informed decisions regarding your oral health. We believe that every patient deserves to have a beautiful, attractive and long-lasting smile. When it comes to your dental experience, we believe the difference is in the details. Not only can you rely on us to offer the latest in dental technology, but we also work hard to provide an atmosphere that is relaxing and inviting. Our office offers amenities such as flat-screen TVs, complimentary beverages and Wi-Fi as well as warm pillows and blankets to keep you comfortable during treatments. You can expect a truly unique dental experience at Riverheart Family Dentistry. Contact our office today to schedule an appointment. Riverheart Family Dentistry supports local charities in the O'Fallon area. Our team is happy to volunteer time, donations, and in some cases dental care. Helping local community groups is an area of focus for Dr. Schwarz and for the Riverheart Family Dentistry team.